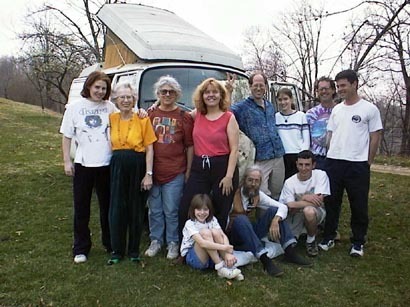 My family in front of cousin Alex Markels' bus that Sam has fixed up and got running. Ruth is my mother, Lynn, Wendy (who took the picture) and Lew are my siblings, Shirley is my wife, Nicole, Simone, and Martine are my daughters, Michael is Wendy's husband, and Wes and Sam are their sons. This picture was taken next to Wendy's garden.